Educators for Aquaponics — Coming in 2014! HomeEducators for Aquaponics — Coming in 2014! Much more will be posted about this in the coming weeks, but here is a short, tantalizing teaser…. A new location for Aquaponics Education will be launched in 2014. This will redefine how individuals can access information on a wide variety of subjects related to Aquaponics. For more information, refer to the upcoming December issue of the Aquaponics Survival Communities magazine. 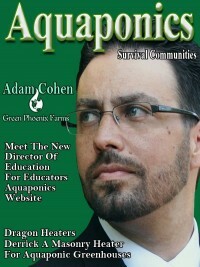 Adam Cohen currently writes for our magazine as the Aquaponics contributor and is now the NEW director of education for upcoming Educators for Aquaponics site. 2014 is going to be a GREAT year we think!!!!!! !